Two weeks ago, I had a very nice trip down to Cape Town. It is a very beautiful city indeed. 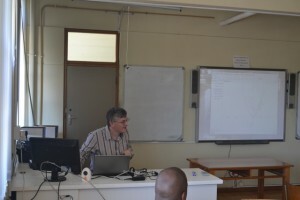 However, I did a series of sessions mixing HP Graphing Calculators, GeoGebra and Data Streaming to groups of maths teachers, trainee maths teachers and undergraduate engineering students at the Cape Penninsula Technical University and the University of the Western Cape. South Africa, in the post apartheid era has been trying to bring all of its education systems up to the level of the former elite schools. As you can imagine, this is a tough task, although the government’s commitment is clear having one of the highest proportional spends on education anywhere in the world. 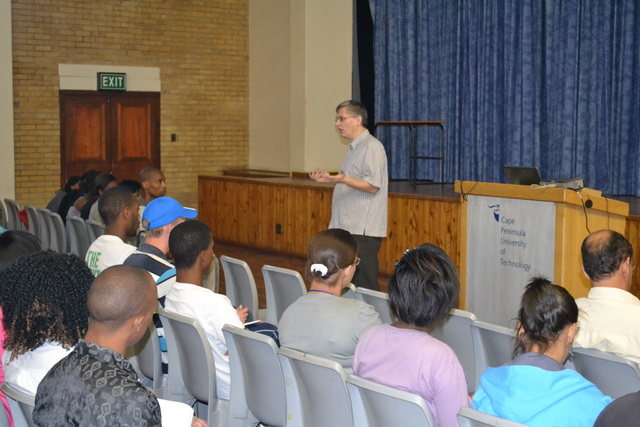 The universities I visited are excellent examples of that move to change and I was delighted to work with really enthusiastic students and teachers. Graphing Calculators are pretty much unknown in South Africa, so it is interesting to see how the technology just makes sense. 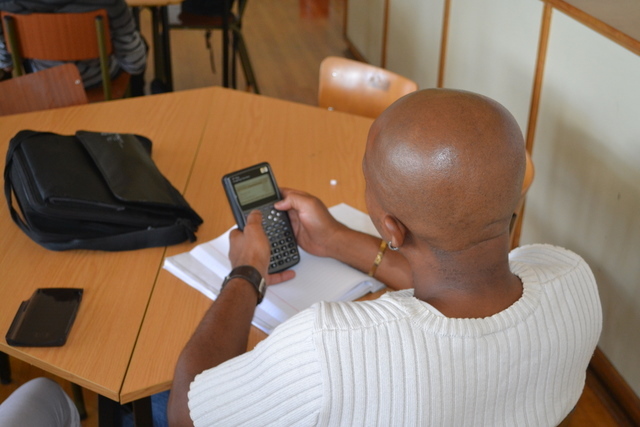 In the end, giving students the opportunity to investigate the effect on changing the coefficeinets in the terms of a linear or quadratic equation in order to gain control of the functions, is a vital part of becoming effective in mathematical modelling. Having a device on which you can rapidly see the relationship between the graph, the function and the table of values, makes developing that understanding fast and secure. It could be a computer suite, or a laptop or tablet PC, but then again, a cheap, reliable graphing calculator works just as well. The students engaged with the maths beacuse they had a tool to support their thinking. I could hand out enough of these tools with the 30 GCs I had squeezed into my suitcase, which did fine in a seminar room with 15 trainee teachers and perfectly well in a large hall with 120 engineering students. A few triple A batteries in the bag meant that everything worked. GeoGebra 4 has just been released and is a major step up from its predecessor. It sems to me that the technology you use in the classroom is all about engaging with a mathematical story. However, often we get stuck in worrying asbout learning the technology. So, I set up the activity using GeoGebra and then set students owrking on the task with the GCs. They had never seen or used either. 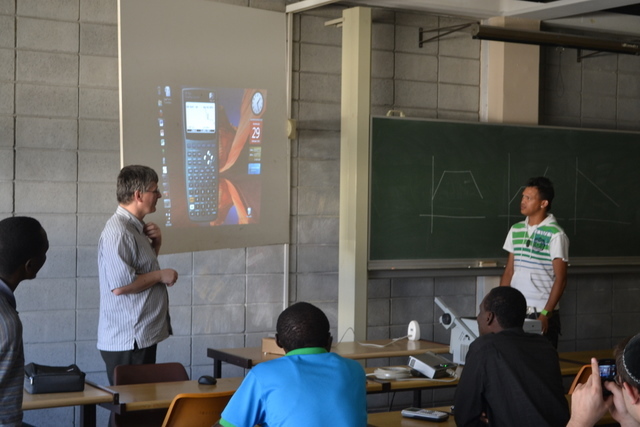 But in a few seconds I had explained the tasks and they were doing and thinking mathematics, never worrying about the technology. The best example of this was setting up a general gradient functions by plotting the value of the slope of the gradient to a function. Tracing the points generates the derivative. If you do this for exponentials, you can see (a) that the derivative is itself an exponential and (b) that somewhere between values in the range of (say) 2.4 to 3.1, there is a value of a in f(x)=a^x where the function and the derivative are the same. Students then take the GCs and investigate different values of a to see when this happens. So, we get a definition for e, rather than starting by stating it. The most excitement was had using the distance sensor to match distance time graphs to actual motion. It is great to see how everyone, from beginning students to experienced teachers, finds this difficult, because we have never had the opportunity to experience distance/time. Quickly the conversation changes to one of rates of chage (faster/slower, further away/closer, …STOP!). I finish with a sine curve and this is really tricky … when should you be going fastest, how should you slow down/speed up? 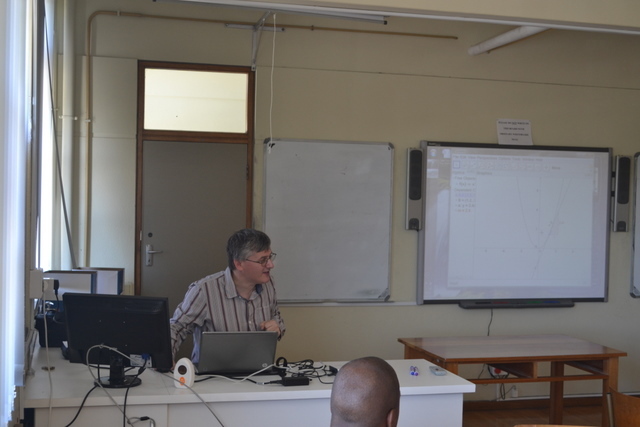 One PGCE studnet teacher at UWC really excelled at this, starting fast, then slowing down decreasing the decceleration to sttop, then slow start in the opposite direction, increasing acceleration to the fastest point …. beautifully describing the rate of change (i.e. the speed) as he went. It hadn’t occured to me before this point how we can ‘feel’ the derivative and describe it in this way. A great trip, some great institutions and some wonderful students. But the key message for me was to see how students (and teachers) can engage mathematically to a new level of depth, with some supporting technology and that even when they’ve never encoutered the technology before, it doesn’t need to get in the way. We just treat it as the tool we are using and keep the focus on the maths and some great stuff happens.